By May 9, 1940, the German army had been advancing throughout Europe mostly without opposition; they had already invaded Czechoslovakia, Poland, Denmark and Norway. Millions of soldiers were posed to strike at the Belgium border, ready to conquer the rest of Europe. In Britain, the opposition had lost faith in the ability of the Conservative PM Neville Chamberlain of guiding the country through the dark days ahead, and the House was desperately searching for a replacement that would be energetic through war time, if it came to that. Darkest Hour is directed by Joe Wright (also director of Pride and Prejudice (2005), Atonement (2007), Hanna (2011), and Anna Karenina (2012)), and written by Anthony McCarten. 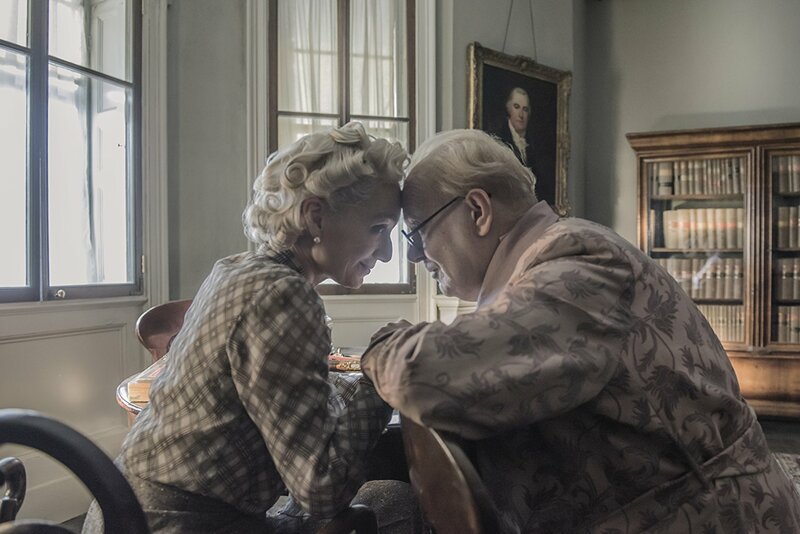 In it star Gary Oldman as Winston Churchill, Kristin Scott Thomas as Clementine Churchill, Lily James as Elizabeth Layton, Churchill's personal secretary, Stephen Dillane as Viscount Halifax, and Ben Mendelsohn in a minor role as King George VI. Director Joe Wright peppers, from beginning to end, this film with black and white historical footage (of the German army advancing through Europe without opposition, of German weaponry, and Hitler’s speeches) that contribute to enhance the movie experience as much as other elements of the film. Perhaps as remarkable as the performances of the whole ensemble is the musical score that underscore tense scenes, and the masterful use of lighting, as in a theatrical production in which the use of direct or indirect light highlights the action. The latter element is used to great effect throughout the movie, as are the close-shot camera angles, with use of small windows to frame face shots, and the use of noise (e.g., loud tapping of a typewriter's keys, the highlighting of specific words as they are being typed, and the loud drop of the counting calendar as the days pass) to signify the heaviness and gravity that come and go with each passing day. 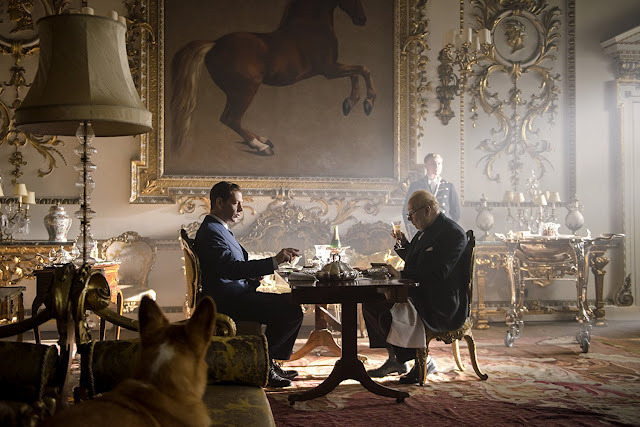 Most of Darkest Hour is shot indoors, while the most intense scenes, dramatically speaking, unfold in the underground offices that house the war council. Despite the overabundance of indoor scenes, more than claustrophobic Darkest Hour feels surprisingly intimate, as if the audience has been given a prime seat to the inner workings of a war time government. Despite the seriousness of the days portrayed in the film, there are scenes peppered with humorous undertones and some laugh out loud moments that give the audience a needed relief from the full immersion in the politicking and drama, some provided by a spot-on Kristin Scott Thomas as Churchill's wife. It seems that the real Clementine Churchill had a sobering effect on her husband, both by speaking her mind and giving much needed doses of wisdom when asked. That comes across perfectly in this film. The fact that Gary Oldman was able to portray so amazingly as much the leader as the statesman, and very much inhabit the character (i.e., become Winston Churchill) is remarkable. 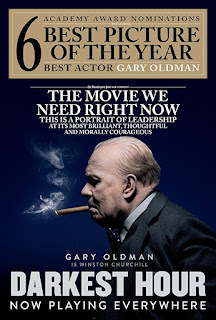 Oldman infused his character with vulnerability at the right times, with strength of character, and the forceful persona characteristical of Churchill. That was a tall order, and Oldman fulfilled it flawlessly. In that regard he very much reminds me of Daniel Day Lewis's portrayal of Lincoln. I cannot avoid the inevitable comparison to the earlier 2017 film, Churchill (See Snapshots - #29) a fictional reenactment of the preparations behind the invasion of Normandy. 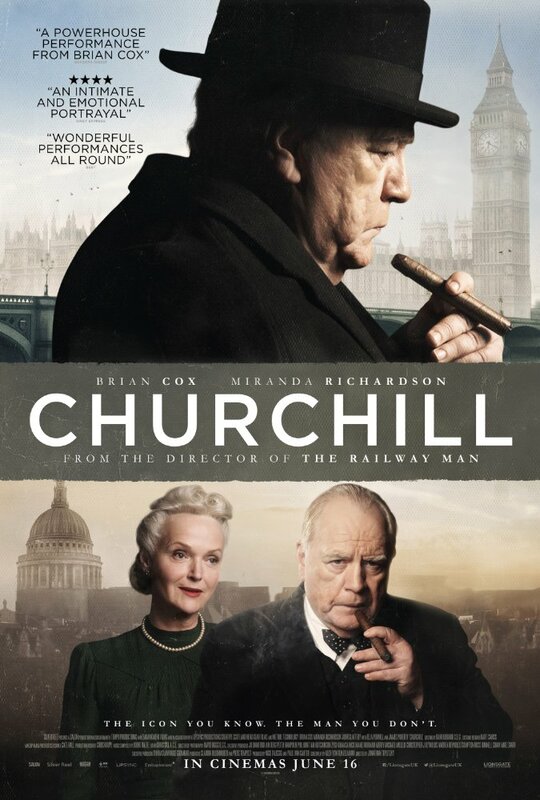 Churchill also boasted of a wonderful performance by Brian Cox as the title character. Unlike Churchill, in which the leader was portrayed more or less as a functional alcoholic with serious self-doubts—about his leading abilities and the questionable success of the upcoming operation— Darkest Hour is very much grounded by a solid and truer to life screenplay that hints at Churchill's taste for liquor, but very much a leader in control, though with the obvious self-doubt that comes from not having the full support of his own political party. Gary Oldman was nominated to the 2018 Oscars in the Best Actor category. He won it, and also swept in the same category in all the other award shows of the season. Gary Oldham is such a talented actor of the school that seems to disappear into a role and truly "become" the character he is playing. I still remember his performance as Beethoven in Immortal Beloved. In fact, it may be my favorite role of his, but I have not seen Darkest Hour. Excellent review Carmen! I like that you compared the both Churchill movies at the end. Having now seen both I have decided that each one serves a function in conveying the deeds and personality of the man during WWII. Then there is the Churchill character in the Netflix series The Crown. I was first exposed to Churchill by Simone de Beauvoir in one of the volumes of her memoirs. Of course that was from the viewpoint of the French left. I think he was one of those people with a personality so forceful and huge that he had to be reckoned with and was either loved or hated with no in between. Frankly I don't know how Clemmie put up with him. Thanks, Judy! You're right, he seems to have been a polarizing figure. I can see what she saw in him and why she loved him. Even the most complex human beings have a more intimate side, one that only loved ones get to see. That could have been the case with Churchill as well. Ohh I loved Darkest Hour. Great quotes too. I think it was my favorite last year. I also liked the other Churchill movie too. Entertaining. Glad you liked these. I'll be going to Normandy soon, I am quite excited. 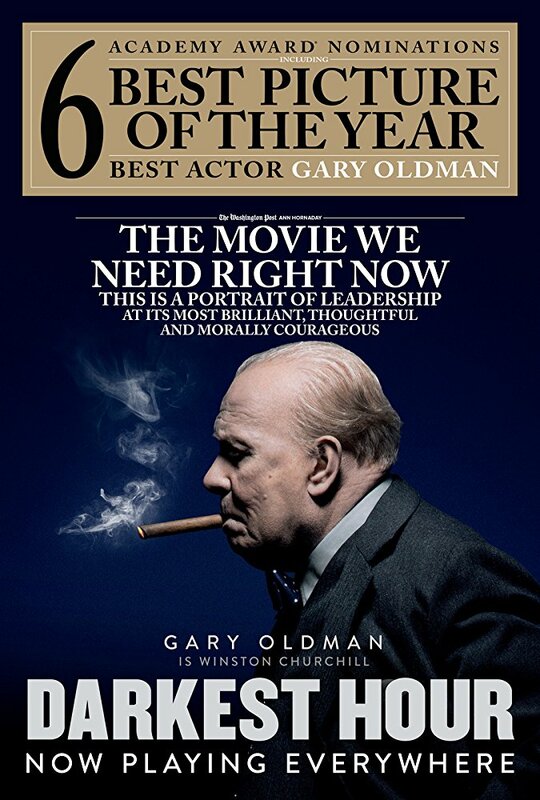 I really enjoyed this one and was transfixed by Gary Oldman's transformation to Churchill. He was nothing short of brilliant! :-) I'm glad you enjoyed this one too.